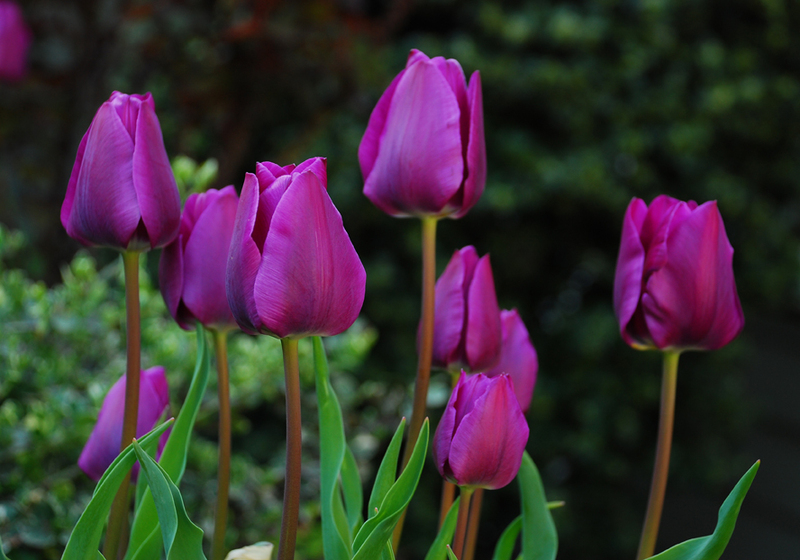 When we left on the doggie walk yesterday morning, I saw these tulips in our next door neighbors front garden. They were still shaded from the rising sun which really made the color pop. I had to get a few shots. Later in the day I asked our neighbors if I could photograph them the following morning. I told them I wanted to ask first if it was okay that some man was crawling around in their front lawn at 7:00 am with a camera. They said they wouldn’t have even known. I know I have mentioned this in the past, but garden centers, farmers markets and other local outdoor venues can provide a wealth of photographic opportunities. This time of year in the area where I live, garden centers are my personal favorite. Whether I am shooting indoors in a greenhouse or outdoors in the nursery, I like to wander around a bit before I get out the camera. By really looking at the displays, I see things I may have missed had I not taken the extra time to snoop around. This is what I would like to illustrate here. 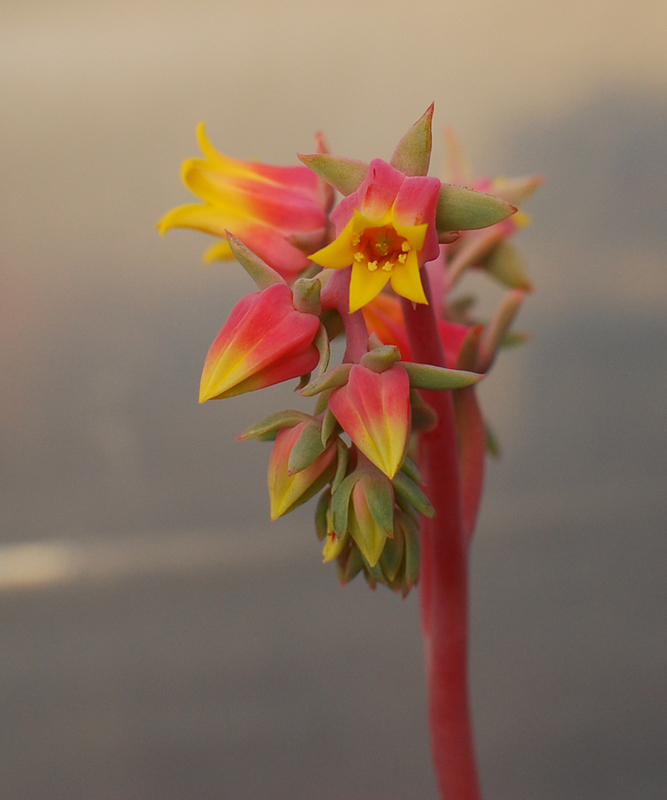 The first photo is a close up of the spring flower blossoms from an Echeveria plant. 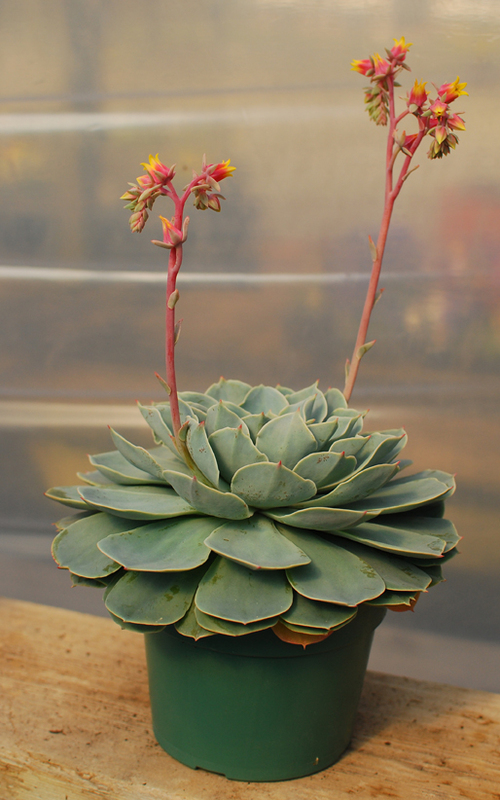 The second shot is an overall view of the whole plant as I first saw it in the greenhouse. Clearly, the first photo is more dramatic. Had I not scouted the location first, I may have passed by this beautiful plant due to the uninteresting setting and distracting background. Spending a little more time in your surroundings before picking up the camera is worth the effort. Finding good vantage points for sunrise and sunset photos in the valley near where we live is not that difficult. Most of the small country roads criss-crossing the farms and small towns in the area eventually make their way to the rims of the valley. From these vantage points, the views can extend for miles, so it’s just a matter of waiting for the right light. And for the relentless wind to end. A good sturdy tripod is a necessity. This time of the year, we’ve been experiencing sustained winds of 10-20+ mph and gusts to about 30mph. March came in like a lion and never left. For several nights I have witnessed magnificent skies. But with the high winds, and the real-feel temperatures in the teens, it just wasn’t practical for photographing sunsets. Finally one night the conditions eased up a bit as the sun neared the horizon. 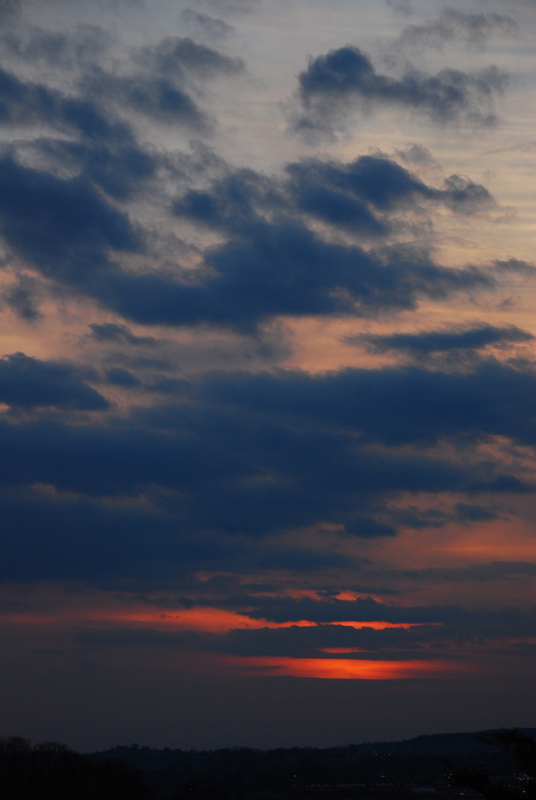 I mounted the camera on my tripod and got a few shots of this sunset. And I didn’t even have to tie sandbags, heavy boulders, or a ship’s anchor onto the tripod to keep it from blowing away. This shot was underexposed 1 full stop from the camera’s recommended setting in order to intensify the color a bit.